I’ve said it before and I’ll say it again. Korea in fall is a sight to be seen. There are plenty of places to experience all the wonderful things about the season, but there is one special destination that allows visitors to experience autumn in all its glory: Seoraksan National Park. I had traveled to Seoraksan a few years ago with my cousin and a friend and while it was a great experience, we underestimated the crowds; thousands flocked to the park at the same time to catch the fall foliage during its peak in mid-October. It was the only time in my life I’ve ever had to wait in line to hike. The scenery was breathtaking, but the throngs of tourists kept me from getting the most out of my travels. 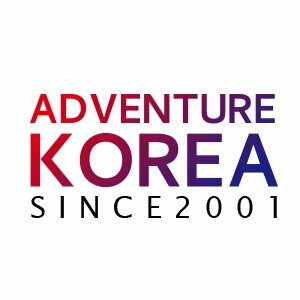 So, when I saw that Adventure Korea, Korea’s number one budget tour company for expats, had a trip lined up for early-November, I knew I had to sign up. Fortunately for me, this meant that I didn’t have to worry about booking accommodations or worrying about transportation. They took care of everything from start to finish and when I boarded the bus in Seoul the morning of the trip, I was surprised at how well-organized and friendly the staff were. By the time we reached the park, located just outside the sea-side town of Sokcho, we were ready to hit the hiking paths, but not before gorging on a bibimbap buffet of all sorts of grains, mountain vegetables, and sauces. After lunch, we were given the opportunity to chose which hiking route to take. I had already once attempted the Ulsanbawi course, an arduous 4km trek that requires a climb up 800 steep metal stairs. Not wanting to be shown up by a bunch of elderly women in much better shape than I again, I joined the “lazy group” and followed our guide to Biryong Falls. The hike was relatively easy though there were a few rough patches. (Note to self: invest in a good pair of hiking boots by spring.) The walk was very pleasant and I was glad to have chosen the easier route, as I was able to enjoy the remnants of the colorful leaves instead of having to keep a close eye on where I was walking. After crossing a number of footbridges and making our way up a few boulders, we took rest at our destination. The waterfall was pretty, but I imagine it’s even more impressive in the summer after the rainy season. After relaxing for a while, we headed to Sinheung-sa Temple. Built in the mid 7th century, Sinheung-sa is believed to be the oldest Zen temple in the world. Although its design is similar to the rest of Korea’s temples, it was incredibly striking during our visit. The paint used to embellish the wooden structures of the complex seemed to perfectly match the fall foliage and the surrounding mountains transformed the humble temple into something majestic. Nearby, we stopped to marvel at the Tongil Daebul (“Great Unification”) Buddha, a larger than life bronze statue constructed in the 1980s and 90s to symbolize the Korean people’s hope for the reunification of North and South Korea. There were many people lighting candles and bowing in prayer under the almost-smiling Buddha, adding a sense of serenity and spirituality to the park. We had booked tickets in advance (which is a must during the high seasons) for the cable car (9,000 won round trip) to the Geongumseong walking course. The path was well constructed and although it involved many stairs, it was comfortable and provided some amazing views of Ulsanbawi and other nearby mountain ranges. I got a bit nervous when we made it to the top (adult-onset acrophobia, perhaps?) and opted out of climbing the steep rock face at the summit. Because of the higher elevation, there weren””t many leaves left, but I was happy simply chatting with our friendly guide, watching adorable families snap cute photos, and breathing in the incredibly crisp mountain air. Just as we made our way to the park’s entrance gate, it began to rain. We drove onto Osaek Valley where our hotel was located. Everyone was exhausted so many of us headed to our rooms and cranked up the ondol (floor heating) to warm up and grabbed a bite to eat. There were also a few hot spring spas in the vicinity for those needing to soak their aching muscles before getting a good night’s sleep. The next morning, we ventured out together to explore the Heulimgol Valley, which has only recently been reopened to the public after 20 years due to damages caused by severe flooding. The trek was easy and included a number of highlights: Seongguksa Temple, a pagoda, Yongso Waterfall, and an opportunity to taste oseak, the region’s famous mineral water. The sights were pretty but the previous night””s rainfall had lowered the temperature significantly, a reminder that winter is well on its way. We warmed up with a delicious lunch of doenjang jiggae (bean paste soup) and some seriously tasty banchan (side dishes) before heading back to Seoul. Judging by the silence on the bus on the way home, it became certain that everyone enjoyed themselves on this delightful excursion to one of Korea’s most beloved national parks. It was also a great chance for me to enjoy one last taste of autumn in the great outdoors before winter creeps in. See you again next year, fall. This overnight trip is called “Seoraksan & Osaek Hot Spring.” Adventure Korea hosts weekend trips to this area throughout the year. It costs 109,000 won and includes transportation (a chartered limousine bus), overnight accommodation, three meals, entrance fees, and English speaking guides. 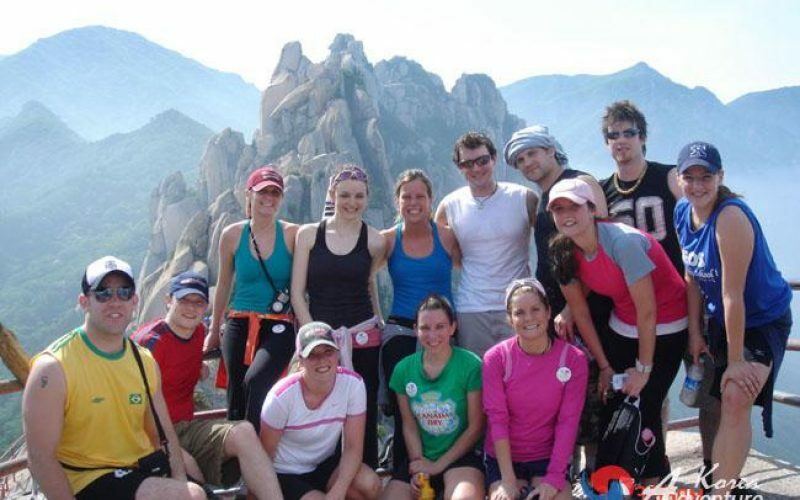 For more trip options, visit Adventure Korea’s homepage.